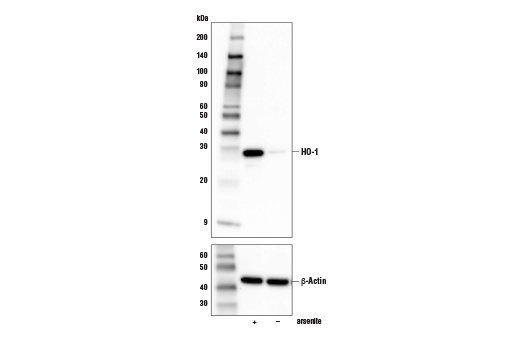 Western blot analysis of extracts from NIH/3T3 cell line, untreated (-) or treated with arsenite (50 μM, 8 hr; +), using HO-1 (E9H3A) Rabbit mAb (Mouse Specific) (upper) or β-Actin (D6A8) Rabbit mAb #8457 (lower). Immunoprecipitation of HO-1 from arsenite-treated (50 μM, 8 hr) NIH/3T3 cell extracts. Lane 1 is 10% input, lane 2 is Rabbit (DA1E) mAb IgG XP® Isotype Control #3900, and lane 3 is HO-1 (E9H3A) Rabbit mAb (Mouse Specific). 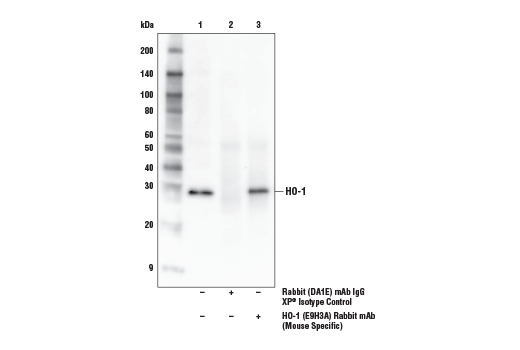 Western blot analysis was performed using HO-1 (E9H3A) Rabbit mAb (Mouse Specific). Mouse Anti-rabbit IgG (Conformation Specific) (L27A9) mAb (HRP Conjugate) #5127 was used for detection. Confocal immunofluorescent analysis of mouse spleen using HO-1 (E9H3A) Rabbit mAb (Mouse Specific) (green) and a B220/CD45R rat mAb (red). Samples were mounted in ProLong® Gold Antifade Reagent with DAPI #8961 (blue). 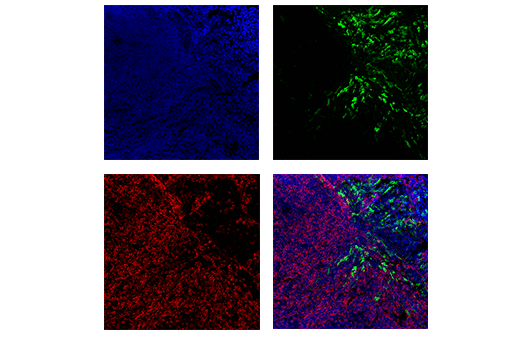 Confocal immunofluorescent analysis of NIH/3T3 cells either treated with sodium arsenite (left, positive; 50 μM, 8 hr) or untreated (right, negative), using HO-1 (E9H3A) Rabbit mAb (Mouse Specific) (green). Actin filaments were labeled with DyLight™ 554 Phalloidin #13054 (red). Samples were mounted in ProLong® Gold Antifade Reagent with DAPI #8961 (blue). Blocking Buffer: (1X PBS / 5% normal serum / 0.3% Triton™ X-100): To prepare 10 ml, add 0.5 ml normal serum from the same species as the secondary antibody (e.g., Normal Goat Serum (#5425) to 9.5 ml 1X PBS) and mix well. While stirring, add 30 µl Triton™ X-100. NOTE: When using any primary or fluorochrome-conjugated secondary antibody for the first time, titrate the antibody to determine which dilution allows for the strongest specific signal with the least background for your sample. For fixed frozen tissue proceed with Immunostaining (Section C). Cover sections with 4% formaldehyde dilute in 1X PBS. Allow sections to fix for 15 minutes at room temperature. Aspirate liquid, rinse three times in 1X PBS for 5 minutes each. 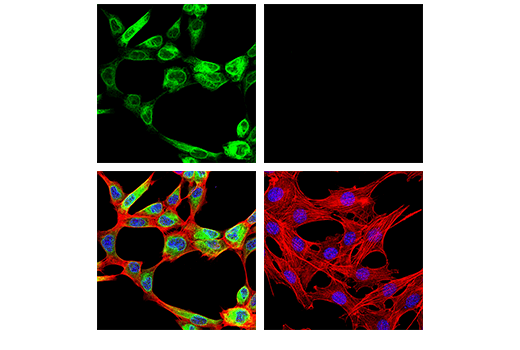 HO-1 (E9H3A) Rabbit mAb (Mouse Specific) recognizes endogenous levels of total HO-1 protein. Monoclonal antibody is produced by immunizing animals with a synthetic peptide corresponding to residues surrounding Glu251 of mouse HO-1 protein. Heme oxygenase (HO) is the rate-limiting enzyme in the catabolism of heme that results in the release of carbon monoxide, iron, and biliverdin (1). The products of this enzymatic reaction play important biological roles in antioxidant, anti-inflammatory and cytoprotective functions (2). Heme oxygenase comprises two isozymes, including the constitutively expressed HO-2 isozyme and the inducible HO-1 isozyme (3). Inducible HO-1 is expressed as an adaptive response to several stimuli, including heme, metals, and hormones (4). The induction of HO-1 has been implicated in numerous disease states, such as transplant rejection, hypertension, atherosclerosis, Alzheimer disease, endotoxic shock, diabetes, inflammation, and neurological disorders (1,5). Abraham, N.G. and Kappas, A. (2008) Pharmacol Rev 60, 79-127. Otterbein, L.E. et al. (2003) Trends Immunol 24, 449-55. Cruse, I. and Maines, M.D. (1988) J Biol Chem 263, 3348-53. Maines, M.D. (1988) FASEB J 2, 2557-68. Schipper, H.M. et al. (2009) Curr Alzheimer Res 6, 424-30. DyLight is a trademark of Thermo Fisher Scientific, Inc. and its subsidiaries. ProLong is a registered trademark of Life Technologies Corporation.